In Lebanon's hotly contested elections on June 7, the Lebanese overwhelmingly voted to retain the status quo, ostensibly rubber-stamping the continuation of sectarianism, corruption, cronyism and dynastic rule. Since the withdraw of Syria from Lebanon in 2005, the country has been divided into two camps. The March 14 coalition—a mixture of Sunni Muslim, Christian and Druze parties—which has largely dominated politics since the end of the civil war, won a majority in Sunday's parliamentary elections, securing 71 of a possible 128 seats. The remaining seats—save two that went to independents—went to the opposition March 8 coalition, led by Shiite parties Hezbollah and Amal, and Christian parties Muarada and the Free Patriotic Movement (F.P.M.) of General Michel Aoun. But while the outcome of the election was a marginal victory for the so-called "pro-Western" March 14 coalition and a defeat for the pro-Iran and pro-Syria Hezbollah and its allies, the election reinforced the political processes that have dogged the country since independence. Under the National Covenant, the presidency is allocated to a Maronite Christian, the prime minister a Sunni, and the speaker of the house a Shiite, while the parliament, following the Taif Accord in 1989 that ended the civil war, is split 64:64 between Christians and Muslims. As a result, all the major political parties are sectarian and the majority former civil war militias: Shiite parties Amal and Hezbollah, Christian parties the Lebanese Forces, Phalange, F.P.M. and Muarada, and the Druze Progressive Socialist Party (P.S.P.). The leading Sunni party, Future, is an exception, only formed post civil war. As a combination of fear, self-interest and tribalism, all left over from the civil war, the 54.8 percent of Lebanese that turned out to vote did so overwhelmingly along sectarian lines and client allegiances—allegiances that purport to safeguard that sectarian identity and, through the party and leadership, pull strings, find employment, dole out cash, and so forth. Neighborhoods, towns and villages are invariably mono-religious, noticeably marked by the political posters, symbols and flags of their respecitve parties. Political leaders have iconic status, with posters of the living and dead adorning walls of houses and shops, the rear windows of cars, and even screensavers of phones and computers. People's allegiances are open and clear, amply demonstrated in the lead up to the elections, and ramping up to a festive display on the eve of the elections. Supporters took to the streets in towns and cities throughout the country to drive up and down the main strip in cars adorned with posters and waving flags on June 6. Political music blasted from speakers. Many were dressed in the color of their party: orange for F.P.M., yellow for Hezbollah, luminous green for Muarada, and blue for Future. It was the same on the day of the elections until the army, out in force over the past few weeks, banned supporters from flag waving or beeping political tunes on their car horns. The dynastic side of Lebanon was also evident. In the Muarada town of Zgharta in Northern Lebanon, the posters were of the party's leader, Suleiman Franjieh—the son of an assassinated politician—along with his 22-year-old son, Tony Franjieh, being groomed to succeed his father. Other posters were of Michel Mouawad, son of assassinated President Rene Mouawad. In Beirut, voters were offered 26-year-old candidate Nayla Tueni, daughter of assassinated politician and editor of An Nahar newspaper Gibran Tueni; Nadim Gemayal, the son of assassinated politician Bachir Gemayal; and Saad Hariri, the billionaire son of assassinated former Prime Minister Rafiq Hariri. Up in the Druze area of the Chouf mountains, P.S.P. leader Walid Jumblatt dominated, the son of Kamal Jumblatt, who was assassinated in 1977, while in Mount Lebanon Sami Gemayal, the 29-year-old brother of assassinated politician Pierre Gemayal and son of former President Amin Gemayal, won a seat. A Phalange supporter, when asked why he was voting for Nadim Gemayal, replied, "Because he is the son of Sheikh Bashir," referring to Bashir Gemayal, who was assassinated in 1982. All of the above was enforced through Lebanese media, with the major parties partly or outright owning six television channels, newspapers and radio stations to put forward their messages. These messages, unfortunately, spoke little of improving health care, education, infrastructure, tax reform, or the environment. Some of the biggest problems facing Lebanon barely got a mention. The country is chronically in debt, to the tune of $47 billion and equivalent to 170 percent of gross domestic product. Power shortages are a daily occurrence, infrastructure is crumbling, and Lebanon ranked 102 out of 180 countries worldwide in Transparency International's 2008 corruption perception survey. Out of a score of five on people's perception of corruption, five being extremely corrupt, Lebanon ranked 4.1, and 65 percent of respondents said the government was ineffective in the fight against corruption. In Foreign Policy magazine's Failed States Index 2008, Lebanon ranked 18 out of 60 countries, on par with Nigeria and just ahead of Ethiopia. Instead of these crucial issues—which would typically be the main talking points of political candidates in other countries—political rivalries, sectarian animosity, foreign relations, and the Arab-Israeli conflict dominated debate. In the lead up to the elections, U.S. Vice President Joseph Biden visited Beirut for three hours to reassure support for March 14 and warn that military aid would be cut if March 8 got to power, while Israel threatened to not hand back a village in Southern Lebanon occupied since the July 2006 war if March 8 won. Reinforcing Hezbollah's position as the country's first line of defense against Israel—the "Resistance"—was a string of arrests of Lebanese caught spying for Israel, while Israel carried out war game maneuvers the weekend before the election. But the election results were not a clear indication of one bloc being pro-Western and the other pro Syria and Iran and resisting Israel. 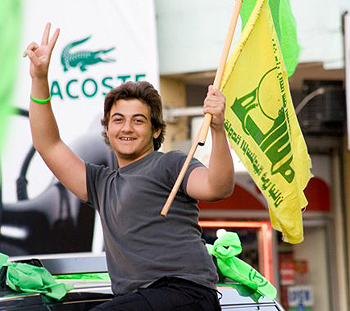 While March 14 is clearly favored by the West, largely because Hezbollah is deemed a terrorist group by the U.S., the Future movement is heavily backed and funded by Saudi Arabia. Politicians who ran on the Future list, such as Khalid Daher in Northern Lebanon, allegedly recruited for Al Qaeda leader Abu Musab al-Zarqawi and his ilk to fight the Americans in Iraq. The March 8 bloc is equally difficult to label, with the Christian supporters who are wary of the other parties and not overly pro Iran and Syria. While the F.P.M. 's platform spoke against corruption, there is traction amongst political analysts that the crucial Christian vote that divided the community between the March 14 and March 8 coalitions was swung by the actions of F.P.M. leader Michel Aoun and Hezbollah. Just months before the election, Aoun paid visits to Tehran and Damascus, a dangerous political move that seems to have backfired, given Syria's past in Lebanon and the growing role of Iran in the region. In May 2008, Hezbollah went against its word, turning its guns away from Israel and pointed them inwards, using armed forces to seize parts of Beirut and Lebanon over a four-day conflict. The move, which shut down the country, made people wary of the party's motives and appears to have prompted Christian voters to side with March 14 against Hezbollah. The March 14 Christian parties campaigned on this heavily, in rhetoric and on political billboards. While the elections were not rigged or tampered with, the election was not above board. The Supervisory Commission on the Election Campaign's (S.C.E.C.) first report in early May identified 293 media violations of just one article of the electoral law committed over a fourteen-day period. The report included libel, slander, defamation and broadcasting that sparked sectarian tensions. Campaign spending is a further area that parties flouted under Lebanon's new electoral law, surpassing the limit of $100,000 per candidate and $2.66 per registered voter in a district. There were also numerous stories of people being flown in to vote, from as far as Sao Paolo and Sydney, all courtesy of political parties. If anecdotal stories are to be believed, vote buying was also rife among the political parties. But while violations can be tallied and campaign finances audited, the body that has just been set up to rule on electoral misdemeanors, the Constitutional Council, can take up to five months to investigate and process violations. And violations can be submitted only by the top losing candidate in a district, not by any others. While the law is there, it effectively lacks any bite. All in all, considering that transparency was never a strong electoral platform of any party, the 54.8 percent of Lebanese that voted got what they voted for: the same leaders, parties and families that have dominated politics in the country for the past thirty tumultuous years. As the French saying goes, plus ca change, plus c'est la meme chose—the more things change, the more they stay the same. Paul Cochrane is a freelance journalist based in Beirut, where he has lived since 2002. He writes for international and specialized publications on business, politics and the media in the Middle East.